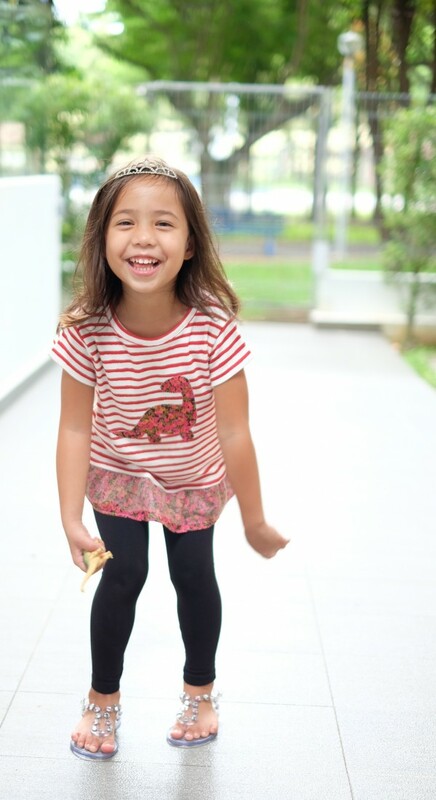 This variation is basically just adding two layers of ruffles to the bottom hem of the Mini Briar t-shirt. I chose to make a straight hemline t-shirt so I used Pattern pieces 1 & 2 for the Version 3 and trimmed the hem straight. Construct the Mini Briar as directed but leave it unhemmed. 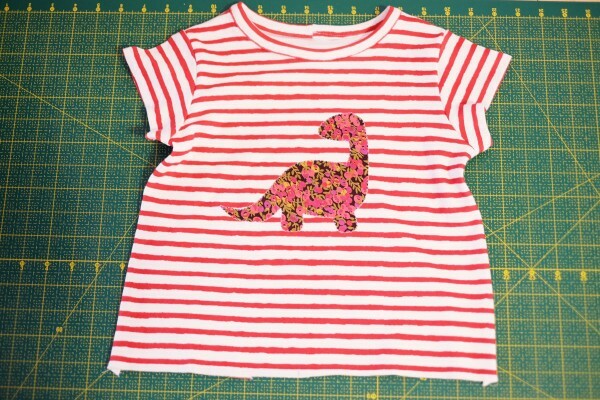 I added a dinosaur applique because she’s obsessed with them. 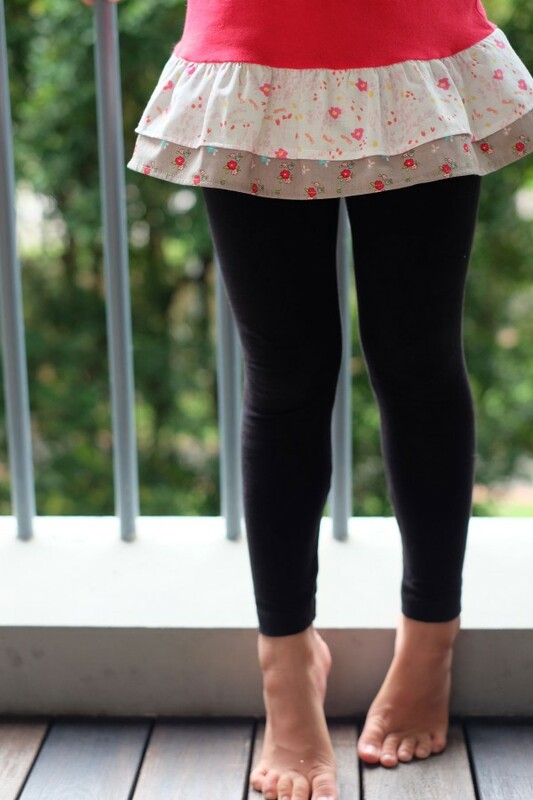 For this tutorial, I used a floral lawn cotton fabric for the bottom ruffle, and a beige/gold tulle for the top ruffle. 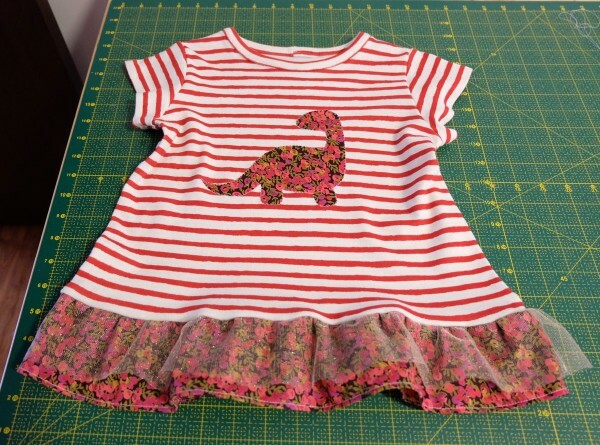 Cut a 4″ tall fabric strip using the entire width of a 45″ fabric for the bottom ruffle, cut a 3″ tall fabric strip using the entire width of a 45″ fabric for the top ruffle. You can choose to add more width to the ruffles if you prefer more gathers. I used the size 2-3 so the bigger sizes will definitely need more than 45″ wide ruffles. Sew the short ends of the bottom ruffle right sides together, press seam open and finish the edges. Then narrow hem the bottom edge, I did this by overlocking the hem and folding it twice. Sew together the short ends of the top ruffle, the tulle doesn’t need hemming (hurray!). Sew the top edge of the two ruffles together with the wrong side of top ruffle facing the right side of the top ruffle. Sew two rows of gathering stitches on the top raw edge of the layered ruffles. 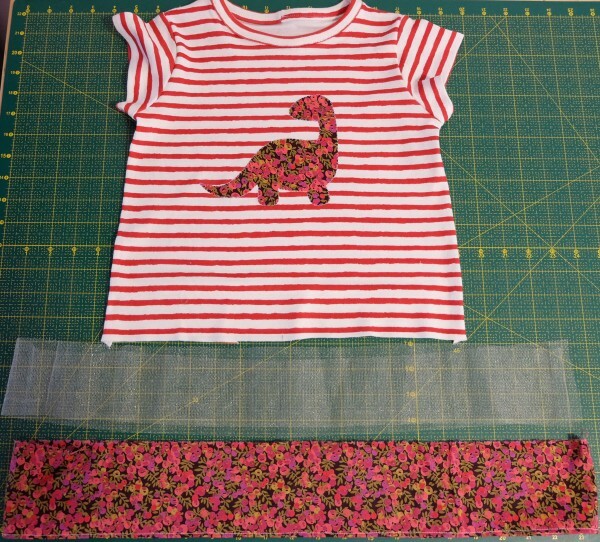 Pin the right side of the top raw edge of the ruffles to the right side bottom edge of the not yet hemmed Mini Briar tshirt. Distribute the gathers evenly and sew. 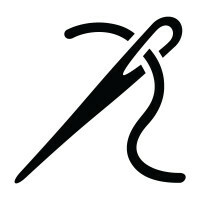 Remove the 2 rows of gathering stitches and overlock the seam. Press the seam towards the shirt. That’s it! My daughter said it looks fabulous (her current favourite word) and she adores the appliqued dinosaur as well. 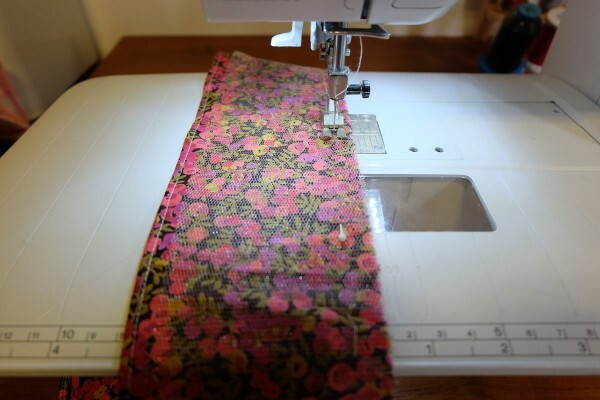 I’ve also tried using 2 ruffles of floral quilting cotton fabrics and they work really nice too. I’d like to try a ruffle using an eyelet trim next time. Or maybe lengthen the top more so it will be a ruffled hem dress. Thanks Megan for letting me share! 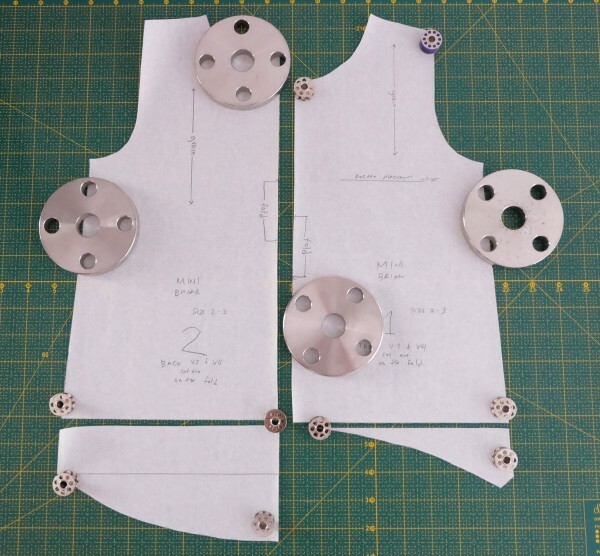 We love seeing your makes! 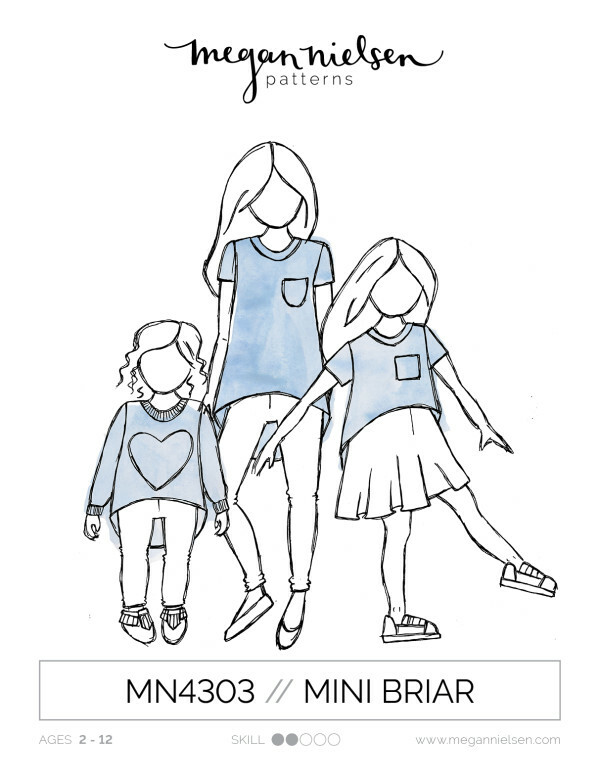 Don’t forget to tag your creations #MNminibriar and @megannielsenpatterns to share your Mini Briar’s. Haven’t bought the pattern yet? Get it in store now in printed or PDF form. 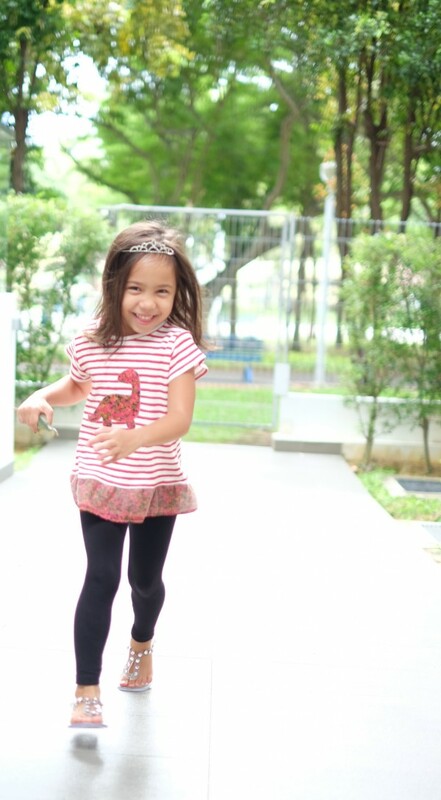 Aw, she is just precious, isn’t she? I love the “contrast” you put in the shirt here. 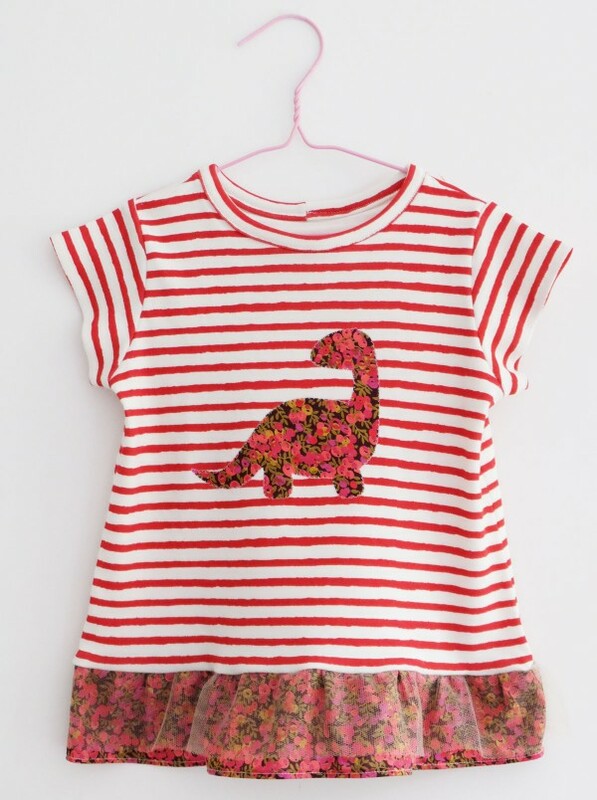 I mean, I wouldn’t think of putting a dinosaur and ruffle hem together in one piece of little girl’s clothing! I’d quote your daughter and say it is fabulous!